THE STORY - In 1979 young Donna, Tanya and Rosie graduate from Oxford University -- leaving Donna free to embark on a series of adventures throughout Europe. On her journeys, she makes the acquaintances of Harry, Bill and Sam -- the latter whom she falls in love with, but also the man who breaks her heart. In the present day, Donna's pregnant daughter Sophie dreams of renovating a taverna while reuniting with her mother's old friends and boyfriends on the Greek island of Kalokairi. ​Donna Sheridan is the new Vito Corleone. Yes, you read that right. Donna Sheridan, the free-spirited, ABBA singing, Greek villa operator played by Meryl Streep in 2008’s "Mamma Mia!" is the second coming of Marlon Brando’s iconic mafia leader. Allow me to explain. Ol Parker’s "Mamma Mia! Here We Go Again" follows a narrative structure that comes straight from Francis Ford Coppola’s "The Godfather Part II." In that classic Best Picture winner, we follow Robert De Niro as young Vito Corleone from his days in Italy, to his immigration to Ellis Island, and all the way to his involvement with the Italian-American mafia. Of course, those scenes are intercut with scenes of Vito’s son Michael in the 1950’s, as he carries out his late father’s legacy. The parallels between Vito’s life and Michael’s make a statement about how our parent’s lives often reflect our own. In "Mamma Mia! Here We Go Again," events pick up roughly a year after we learn that Donna Sheridan (Meryl Streep) has passed away. Given that Donna’s presence played such a pivotal role in the lives of people close to her, her absence is felt throughout the film. Donna’s daughter Sophie (Amanda Seyfried), is hurting without her mother’s guidance. Sophie is preparing for the grand re-opening of the gorgeous Hotel Bella Donna. 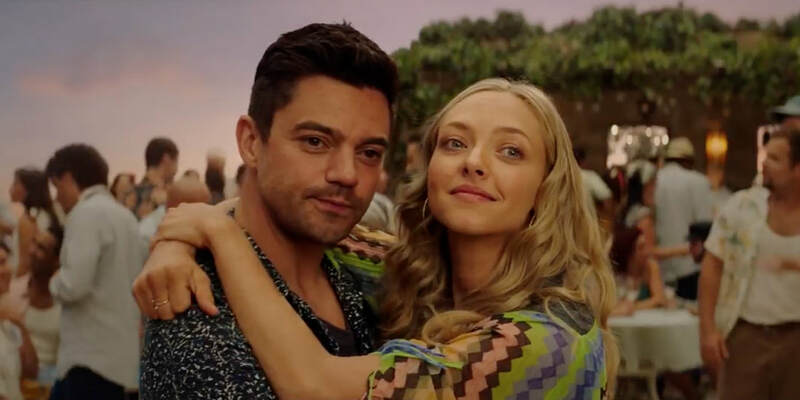 Yet with her mother gone and her husband Sky (Dominic Cooper) in New York on business, Sophie feels as if she is at a loss in life. Cut to 1979, as we meet a younger version of Donna played by Lily James. She arrives at her college graduation to deliver the class commencement speech. In typical movie musical fashion, young Donna breaks out into song, specifically ABBA’s 'When I Kissed the Teacher.' This first musical number sets the tone for the rest of the film. We see pivotal moments in Donna’s early life that shape the woman we saw Meryl Streep portray in 2008. Those moments are reflected against Sophie, leading us to learn how the two women followed similar paths in life. It would be easy for this type of framing device to fall flat. Juggling different timelines is tough enough. Add to that the task of assembling musical numbers and casting young actors to resemble the veterans we know and love. But credit must be paid to writer/director Ol Parker, who makes the transitions flow beautifully. He doesn’t cut from one sequence to another just for the sake of it. Like "The Godfather Part II," there is resonance behind every time shift. Furthermore, Lily James is exceptional here! She captures the same energy and spirit of Meryl Streep‘s performance while still making the character of Donna Sheridan her own. Also notable are Jessica Keenan Wynn and Alexa Davies as younger versions of Tanya and Rosie, played by Christine Baranski and Julie Walters in the present day scenes. Jeremy Irvine, Josh Dylan, and Hugh Skinner do a great job of presenting younger versions of Sophie’s three fathers’, Sam, Bill, and Harry. Of course, Pierce Brosnan, Stellan Skarsgård, and Colin Firth play the three men in present-day scenes. Kudos to casting director Kathleen Chopin for finding fresh yet recognizable young talent. Full disclose- I am a passionate fan of the original 2008 film. It is a total delight and joy that I hold near and dear to my heart. So, for as well integrated as the flashbacks here are, I much preferred the present day scenes with formerly established characters. When the old gang comes together for the first time in this film, it felt like a joyous family reunion. The fact that such a reunion was set to the incredibly catchy 'Dancing Queen' only made emotions all the more irresistible. We even get a welcome appearance from Cher, who is an absolute joy as Donna’s mother and Sophie’s grandmother. While the megastar doesn’t spend much time on screen, it is so great to have her back even just for a little bit. Her key moment comes in singing about Andy García’s character, a hotel manager who just so happens to be named Fernando. Yes, you know where this is going, and it is just as wonderful as you probably expect. In dealing with Donna’s untimely passing, the film strikes a much more melancholy tone than its predecessor. This is still an enjoyable summer romp, but unlike the original, it is not an over the top karaoke dance party. Instead, it is more like the reflective after-party. Don’t expect to find a dry eye in the house when Meryl Streep finally does make a brief appearance as Donna. No spoilers, but she returns to impart guidance and wisdom to her daughter when it is needed the most. While Meryl may only be on screen for less than five minutes, she certainly makes an impact. That’s an example of true greatness.